— In the new movie "Gravity," starring Sandra Bullock and George Clooney, it's possible to forget you are watching a film and not NASA footage. That is because director Alfonso Cuarón chose to set his story about astronauts stranded on a spacewalk within the setting of real spaceflight, recreating, often in painstaking detail, modern day spacecraft and hardware. 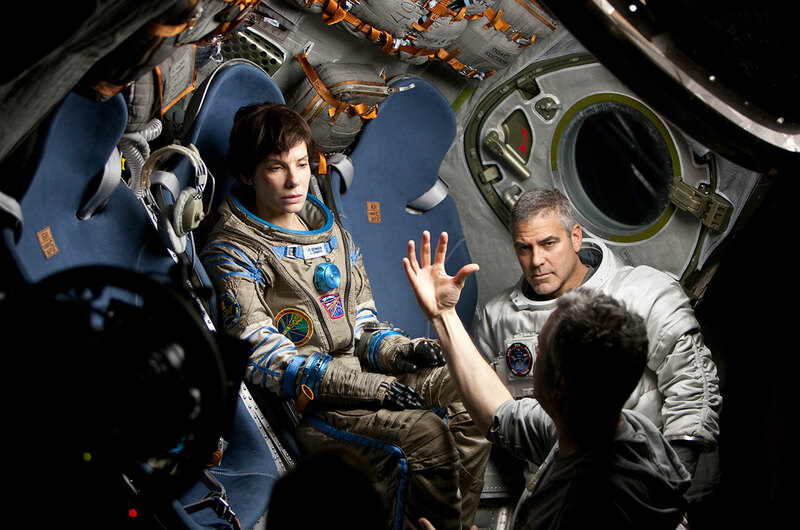 But Cuarón is clear about what "Gravity" is, and what it is not. Warning: Minor spoilers follow. "This is not a documentary," the director said in a recent interview with collectSPACE.com. "It is a piece of fiction." 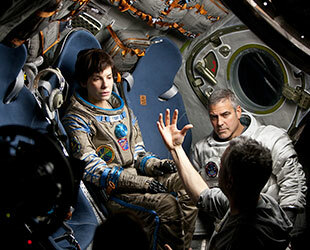 Cuarón, however, did not want to invent new spacecraft to fit into his fictional storyline. He specifically chose to use the space shuttle (which was still flying when production began on "Gravity" in 2010), the Hubble Space Telescope and the International Space Station to pay tribute to their achievements. "I am fascinated by space exploration," he said. "I have a big huge respect for the people who have made it happen. For my money, the most amazing piece of technology that humanity has ever done is the Hubble Telescope." "Since I was a kid, I followed space exploration because I am from the generation who saw the man stepping on the moon for the first time," Cuarón explained. "So for me that whole idea of doing the setting in space and honor what is in there, not trying to invent, that was the thing." "Why invent when you have the most amazing technology up there?" 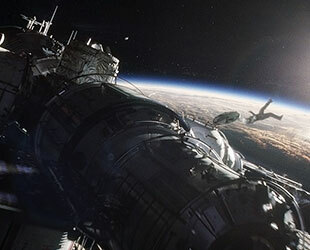 Cuarón didn't need to invent the spacecraft, though he and the team behind "Gravity" did need to create new methods of filming, as well as hundreds of detailed props and very intricate digital models to bring the vehicles to life on the screen. But to tell the story he wanted to tell, the director found he needed to divert from reality, changing the space in which the real space shuttle, space telescope and space station exist. "In the frame of the fiction, we wanted to be as respectful and accurate as possible," Cuarón shared. "But obviously, we had to take a big, big leap and a big, big freedom to tell the story." 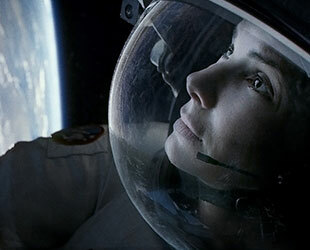 Cuarón strove to get the physics of gravity — or rather the physics of microgravity — correct, emphasizing the film's title and the metaphorical struggle that it represents for the movie's characters. But if he insisted on the same level of realism with other details, such as the many procedures that NASA trains its astronauts to follow in order to avoid problems, it would have weighed down the plot. "The amazing thing about the space program if you think about it, how many missions they have done ever since it started, how many incidents they had — very minimal," he stated. "Because the space program has a lot of alternate procedures for any circumstance." Those procedures needed to be simplified in "Gravity," as did the spacecrafts' locations. "The orbital position, they are in different orbital planes… and we had to put them in a similar orbital plane because otherwise we would not be able to tell the story," explained Cuarón. In reality, it is not possible to easily transfer between the Hubble Space Telescope and International Space Station, or the station and China's spacelab Tiangong-1, because they are in different orbits. 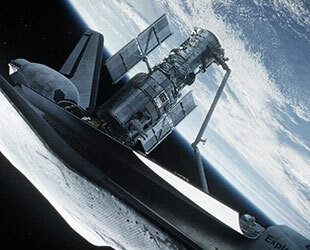 The space shuttle, when it was flying, and Russia's Soyuz spacecraft, cannot fly between the outposts and orbiting observatory, at least not without being redesigned and carrying considerably more fuel. Cuarón didn't just adopt the changes to orbital inclinations and procedures without first trying to make them work. "We did a draft where we tried to respect everything," he revealed, adding that the end result was a towering script. "Everything was just about explaining to the audiences all of that stuff, so we had to try to create a balance." It wasn't only Cuarón who was working to get things right. Sandra Bullock, who readily admits to knowing "absolutely nothing" about spaceflight before signing on to "Gravity," delved into the part to accurately portray an astronaut. "It is like going back to college and researching a paper in a world that you're totally unfamiliar with but it is your job to do," Bullock said. "The more you dig deep, the more you can nuance yourself and your character." "In this case, you have to understand the technology that was foreign to you, a body movement that was foreign to you, verbiage and technology that made no sense but that you had to learn it enough so that it made some kind of sense while you were doing it, so you could be authentic while portraying it," Bullock added. In the end, the attention that was paid to authenticity not only helped tell the story, but made "Gravity" a movie and an experience. Bullock cited the film's virtual Earth as an example. "Two hundred and fifty people worked on every single frame of the movie to create the magic of Earth," Bullock said. "It is a live organism but we never look at it in that 3D, moving way. It is always sort of, 'there's Earth, she's round, we know the lakes, we know the grass.'" "They created such a live character with Earth and space I think it gives you such a visceral experience of watching this movie that you feel like you are actually floating right above us performing in it," Bullock remarked. "So we gave you a portal into space."